So, You Want To Get A Ferret, Huh? You’ve been eyeballing those cute little ferrets for a while now, and now you’ve got the bug, and just have to have one for yourself! Well, I hate to be the one to break the news to you, but there is a pretty big learning curve involved, one that doesn’t include watching a ferret documentary on the Discovery Channel. Actually, that documentary will really give you a screwed up idea about ferrets! Ferrets have been domesticated for thousands of years, and the ones we get as pets have, believe it or not, pretty much no outdoor survival skills whatsoever. No, really! I’ve heard the stories too, but trust me, I’ve owned a few ferrets, and all those great survival skills have been bred out of them, just like all the great wolf skills have been bred out the the chijuajua. So, this site is all about learning about the domesticated ferret, and how to care for one. Tip #2 So, I couldn’t talk you out of a ferret, huh? Many ferrets wind up in ‘foster care’, or neglected and sad. Many owners fall in love with them at the store (what’s not to love? ), but then they find that caring for a ferret is a daily reality/chore. Are you willing to dedicate several hours a day to a ferret? Really? They need your love, and play time. Ferrets get very attached to their owners, some even to the point of not eating when owners go on vacation. having you get tired of the routine, and giving them up to a ferret shelter doesn’t cut it, and many ferrets simply don’t make the transition to foster care. And neglecting your ferret is a crime, both legally and morally. Better for you (and the ferret) to not get one,than to get one, and realize you can’t deal with it. You must make a solemn vow to care and love it until it takes its last breath, with you holding it and comforting it as it passes. Ferrets love you dearly, and they deserve nothing less. Owning a ferret is a privilege, not a right! Are you willing to clean their cage every day? You need to clean their ‘bathroom’ every day, or they poop next to it, and make a mess. Are you willing to forgive regular times when they couldn’t make it to the potty? Ferrets have ‘accidents’ on a regular basis, as their bodies aren’t made for ‘holding it in’. Ferrets don’t think like dogs or cats. You can’t just ‘rub their noses in it’, and have them understand what you want. Ferrets react to positive re-enforcement. They don’t seem to understand much on the negative re-enforcement side. Who will look after them when you go on vacation? Your Aunt Mildred may love you like the dickens, but probably won’t relish taking care of your little loved one while you enjoy your umbrella-enhanced drinks on some far off beach. And you can’t just leave a ferret alone for weeks, or even days, while you got off on holiday. Is there a good vet in your area that even know anything about ferrets? You’d be surprised, but many vets don’t have much experience with ferrets, and finding a good one nearby can be difficult. Ferrets need regular rabies and distemper shots, they need to sometimes ‘go to the dentist’, and they sometimes get into serious emergencies. Can you afford the vet fees? Don’t kid yourself. Taking a ferret to the vet is expensive. Anything more than a rabies shot, and the bill can top at over $1000. Is your house ferret proof? You can avoid some emergencies by ferret proofing your home, essentially crawling around on your hands and knees looking at anything they can get into trouble with. If there is a hole, they will find it. If you don’t put latches on your cubbards, they will get into them. If there is a tall shelf in your closet, they will climb up there, and if there is anything up there, valuable or orherwise, they will push it off, usually right before they fall off themselves. They are naturally clumbsy, and you need to make sure they can’t climb up so high that if they fall they get hurt. If you have a second floor, and they could fall off a drop to the floor below, they will. Ferrets dance around crazily, and fall off things without paying any attention to the danger. Do you have small children, or is there any chance you may in the next 6 or so years? Ferrets and babies don’t mix very well. Can you remember to not step on them? Ferrets are incredibly fearless, and they trust you to the point of being suicidal. They dart under your feet as you are walking, thinking it’s all fun and games. It never occurs to them that you could easily crush them with a single step. They are quick, silent, and come from nowhere, suddenly in your way. They know somewhere deep down inside that you love them deeply, and would never step on them. Can you remember to keep that kind of faith for them? So, I couldn’t talk you out of a ferret, huh? So then, where are you going to get your ferret? Yes, you could go down to the local pet store, and pick one up, but seriously, why don’t your look around, and adopt an abandoned one? I purchased my first ferret from a pet store, the only one I got that way. The next was offered from a friend who realized she wasn’t giving her ferret the attention the ferret needed. The third ferret, I posted an ad on Craigslist, that I was looking for a ferret. The fourth, I ordered another friend to give me after I found out the ferret was stuck in a cage in the garage, neglected. Finally, although I haven’t gone that route myself, adopting a ferret from a shelter is still better than buying one at the store. It’ll probably cost you money, but hey, those folks take in ferrets and look out for them, and they deserve every penny they can get their hands on! So you see, it’s actually better that you adopt a ferret than buy one, if your mind is set on owning a ferret. It would be better for the ferret, since you could put the money you ‘saved’ into things you’ll need for the ferret: cage, food, toys, etc. Otherwise, you’ll just have less money to spend on these things, and the ferret you adopt will be one less neglected ferret that winds up at a shelter. Ferrets have no way to break down plant based protein. Do not ever feed them fruits, vegetables, anything with a high sugar content, or any junk food you happen to be eating. Ferrets imprint on foods when they are young. This means that they may not see that the expensive ferret food you just bought is food at all. If you adopt one, be sure and find out what brand food the ferret is used to. Then you can try mixing that food, a little bit at a time, with other ferret foods until the ferret thinks it’s food, too. Some folks skimp on the ferret foods, and give it food meant for other animals. Not a good idea. If you get a ferret that is used to say, kitten food, try switching it to a premium ferret food. Ferret foods are getting better than they have been in the past, and kitten food doesn’t cut it any more. If you absolutely have to feed it kitten food, make sure it has at least 30 to 40 percent high quality animal-based protein, NEVER plant based! It also needs to have 20 to 30 percent fat, and very low carbohydrates and fiber, less than 3 percent. NEVER use store brand or generic foods. The bottom line? Give you ferret premium ferret food, and try to use a mixture of several brands, in case one is no longer available. seen here. We keep two ferrets in it, and it seems comfy enough for them that they usually return to it by themselves when they get tired. It’s held together with zip ties for strength. Zip ties are also used for hinges. Doors are kept shut with bolt snaps. 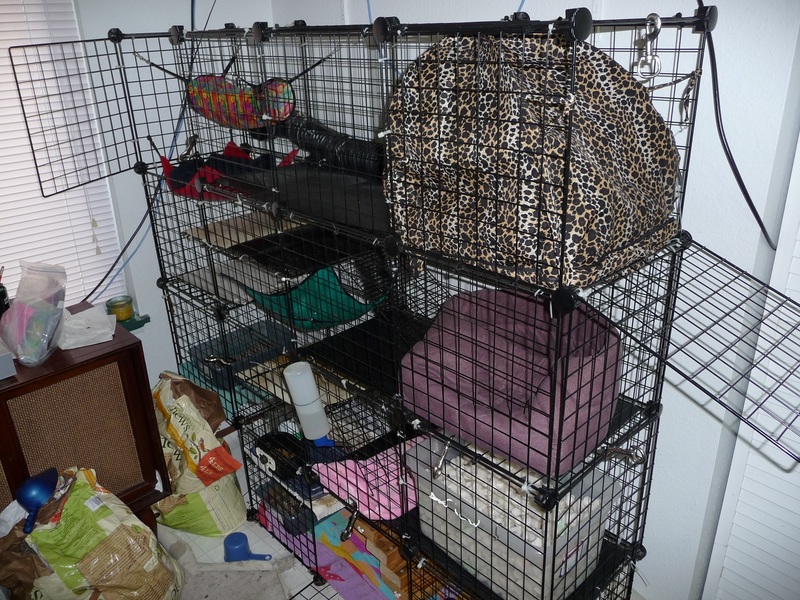 The cage itself is around 5 feet tall, by around 6 feet long, and 14 inches wide. It doesn’t take up so much room by being only 14 inches wide, and the ferrets seem to really like it. There is scrap linoleum under the cage, and used on floors inside the cage. Plastic tubs make up the ‘bathrooms’, you need to hold them down with wire hooks, or the ferrets will spill them. Other scrap pieces of wire and wood are used for climbing aids. There is also some plastic tubing I found at the hardware store for them to crawl through. They also have a plastic tub filled with packing peanuts to dig in. My wife found a little tent for them. They didn’t seem interested in it until I put it inside the cage, now they really like it. The hanging tube they never use. The point of this is, you can make your own ferret cage if you have a clue as to what you’re doing, and you are responsible enough to make sure it is safe for the ferrets. The word ‘Ferret’ orginally came from a word meaning ‘thief’. Take that to heart next time you are looking for your car keys, and your ferret is innocently looking at you! Ferrets are related to weasels, wolverines(! ), minks, badgers, and polecats. Baby ferrets are called ‘Kits’, females are ‘Jills’, and males are ‘Hobs’. Ferrets love to sleep, up to 18 hours per day. Make sure there is somewhere they can get total darkness to sleep, there is growing evedence that this gives them less health problems. Most ferrets sold in America are spayed or neutered, and have their scent glands removed. Many have 2 tatoo dots on one of their ears, one signifying the de-scenting, and the other for the spaying or neutering. Ferrets have a musky odor, and bathing them often will result in them actually making more scent to fix their dry skin! Ferrets are highly susceptible to canine distemper, and may be to feline distemper as well. It is 100% fatal. Ferrets need a yearlydistemper shot that covers both kinds of distemper. Ferrets are also highly susceptibale to rabies, and need an annual rabies booster shot. Ferrets are susceptible to several strains of human influenza. Ferrets can also get heartworm from mosquitoes. Lacking sweat glands, ferrets can get heat stroke. Never let your ferret experience tempratures above 90 degrees. Ferrets are also susceptible to other various deseases and health problems. They need to have regular checkups, just like humans do! When it comes to training a ferret to do almost anything, you need to understand one thing: Ferrets need positive training. They just don’t get most negative training. If your ferret doesn’t already come potty trained, encouragement is the way to go. So, in other words, DO NOT RUB THEIR NOSES in anything. Start by placing the results of one of their ‘accidents’ in the litter pan. This gets them used to the idea. If you see them backing into a corner (a telltale sign), and you’re quick, you can pick them up and put them in the litter pan. If you catch them using the litter pan, reward them with a treat. Change it often when they do start to use it, or they will find somewhere else. A word of warning… The litter pan need to be securely held in place, or it will get over turned. Get a clay based litter. It plays havoc with their respiratory systems, and causes other problems. Get a ‘clumping’ litter. This stuff can kill your ferret. Use wood chips from pine or cedar for litter. The aroma isn’t good for the ferret. Neither are splinters in their digestive track. You can use wood pellets (if the aroma has been removed), or a 2:1 mixture of wood pellets/rabbit pellets. We bite the bullet and use something called ‘Yesterdays News’. that is a cat litter made from recycled paper. Clipping a ferrets nails is best performed by two people. One holds the ferret by the scruff of the neck in one hand, using the other hand to help support the ferrets weight, while the other person gently clips the nails. Don’t clip them too short, you can hurt the ferret. Performing the clip job one handed isn’t nearly so easy. I find that putting some FerretVite or FerretTone on their belly distracts them long enough to get the job done. While they are licking their belly, you are clipping away!